Drivers could be allowed to travel faster through roadworks on motorways during quiet days such as Sundays. 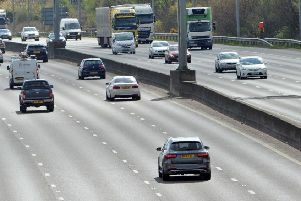 Highways England revealed it is going to test varying the speed limits from 50mph up to 60mph in a bid to reduce drivers' frustration at roadworks. It is also exploring if different speed limits could operate within one set of roadworks. This could mean people travel on one carriageway at 50mph as they are nearer the workforce, but can drive on the other carriageway at 60mph as the road workers are further away. Jim O’Sullivan, chief executive of Highways England, said: “People understand roadworks are necessary but are also frustrated by them. At the same time we have to ensure as they drive through them that they, and our road workers, are safe. The move comes after the agency said there were nearly 300 incidents a week of drivers entering coned-off areas or subjecting road workers to physical or verbal abuse on motorways or major A-roads. A study by Highways England released in October 2017 found 60 per cent of drivers who drove at 60mph through a roadworks zone had a decreased average heart rate indicating a reduction in frustration. The RAC welcomed a trial but said continued use of average speed cameras was also "essential." A spokesman for the breakdown service said the safety of road workers is "paramount" and added: "the use of average speed cameras have been very successful in controlling speed. "Increasing the limit will do away with some of the frustration for drivers." Highways England said should the proposals be fully rolled out they would come into effect in late 2018 or early 2019.